I was 29 when I was told I could no longer be the parish’s youth minister for budget reasons. The pastor wanted to keep me on board, but I would have to be their new director of religious education for 1,400 students. I would have left, but my wife was pregnant, so I took the job. It is not a glamorous field. But the people who do it for a living work really hard. Here are a couple of things I have learned in my 16 years of working in youth formation that I believe can transform a religious education program. Religious education is broken. It's time to fix our Sunday school culture. How would you rate your experience of parish-based religious education? Most of the effort we put in should not be directed toward kids but toward the adults: parents first and catechists second. They need to be evangelized. And there is a difference between evangelization and catechesis. The two support each other, but they are not the same thing. In catechesis, you encounter church teaching, but through evangelization, God meets you, you meet God, a relationship develops, you commit yourself and then you learn more about each other. It is not that parents and catechists are lazy about their faith; they just need formation, too. We begin by communicating the Gospel. The Gospel speaks to their anxieties and their work. Systematic catechesis is important. It is essential. But it is not an end in itself. The value of systematic catechesis is experienced in the context of a lived, experienced faith. It should not feel like trivia. Make religious education about evangelizing parents within the rhythm of a kid-based program. The Exodus, the Transfiguration and the Last Supper were shared experiences. They forged an identity and an indelible memory that stood when everything else fell apart. Regular family dinners or movie nights do that. So can religious education. Serve families in their everyday needs and don’t just throw teaching at them. St. Paul was a tent-maker by trade. He started as being an excellent, trained Pharisee, but after his conversion, he realized it took more than throwing teaching at people to move their hearts. He first worked with people in their everyday lives and then shared the Gospel with them. Parents have needs, and people need the truth. People are more likely to be open to hearing the truth if they know you occasionally feed them and give them free babysitting. What do I want them to know? What is the real goal? That God cares about their lives, that they can rely on God, that the sacraments work, and that this is Christ’s church. The programs I direct exist to make that real for them. Criticism of what we do is in no short supply, but if you think that it can be done better, then do it better. If you think your grand ideas are being dismissed from the pastor or director of R.E., then humble yourself and become a “lowly” catechist. Make it your business to serve people in their messy lives. Your classroom-based program is your parish’s single greatest opportunity to walk with young families as they struggle to integrate the sacramental life of the church into the rough-hewn contours of their lives. 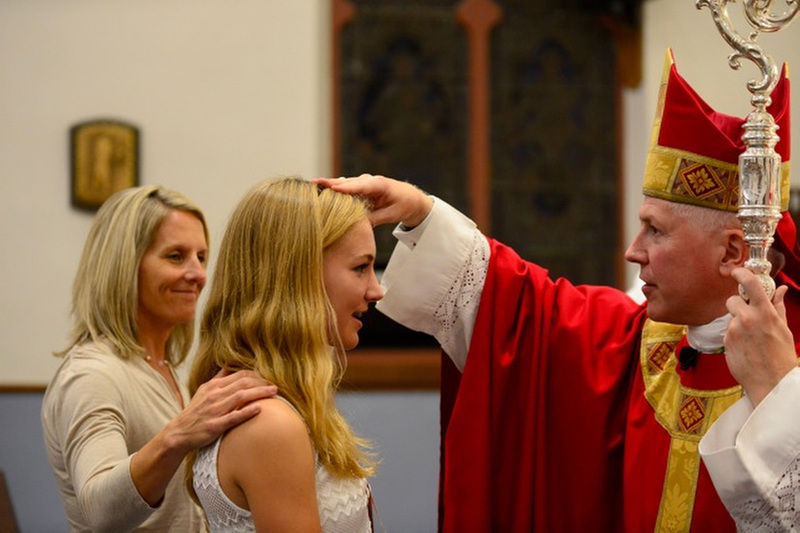 Some commentators lament the “carrot on a stick” mentality regarding sacraments. I don’t. Graduations, Sweet 16’s, first birthdays, Father’s Day—all of them can seem like empty greeting-card milestones rife with compulsory recognition and suspect motivations. But they don’t have to be, and most people don’t treat them that way. So what if someone comes into sacramental preparation like it is a token milestone? It is our job to make it meaningful. The church does not change the date of Christmas to throw those with different motivations off the scent. Routines can be sanctified. That is silly talk. The Catholic Church might seem like some huge powerful structure with parish priests at the ready, eagerly waiting to receive the latest dictates from Rome. But the reality is this: Parish staffs are made up of way too few people who are trying their best with their limited resources. The same position might be salaried in one parish, part-time in another and volunteer in another. The average parish has to play the role of a support-group hub, food pantry, nursery school, community center, sewing circle, caseworker and a million other things that you would not think happens at a church but does. The Catholic Church might seem like some huge powerful structure with parish priests at the ready, eagerly waiting to receive the latest dictates from Rome. But the reality is this: Parish staffs are made up of way too few people who are trying their best with their limited resources. Diocesan offices are comprised of people with thankless jobs and who are often criticized without ever being met. They keep safe environment standards consistent; offer guidance to impossibly diverse parish situations; assist in the legal and administrative quagmires of running large, loosely networked, semi-autonomous community centers; and mobilize large charitable initiatives. They do more than anyone can expect. But they exist to serve the parishes. The parishes exist to serve the people. They can only serve the people with often impossibly few resources if people step up and make the sacrifice of their time, their gifts, their presence and especially their commitment to serve the Gospel. "And there is a difference between evangelization and catechesis. The two support each other, but they are not the same thing. In catechesis, you encounter church teaching, but through evangelization, God meets you, you meet God, a relationship develops... he realized it took more than throwing teaching at people to move their hearts". My only problem with the article is how does one encounter God without knowing some or any church teaching. Different personalities are going to respond to different stimuli. For a person with an engineers mind like myself, the teaching is precisely the encounter with God. Prior to becoming Catholic I was bombarded with multiple denominations and religions. What allowed me to find God was the encounter with what he left behind in his established Church on earth through Peter. It was the teaching and robust complimentary theology that finally allowed the scales to fall from my eyes so to speak. The teaching is not arbitrary or some secondhand requirement- it's the truth of God revealed to us in both the Spiritual and Corporal elements. The teaching may not be everyone's foot in the door to communion with the RCC, but it is for a lot of people and shouldn't be discounted. Tom, this is probably one of the most positive articles on religious education I have read in a while. But, your premise that we should "make religious education about evangelizing parents within the rhythm of a kid-based program"... is not recognizing how broken the system is. 1, Parents feel like they are doing their part by getting them to weekly class. 2. Weekly religious education has very few connecting points with parents. Recently, I had a conversation with 5 seasoned DRE's and none fo them communicate with parents about what was covered in "weekly religious education" and how parents can help continue the lesson at home. One of them actually said they were relying on the catechist to do that. So, if they aren't utilizing the tool in front of them to build bridges with parents, who is? When these children were baptized, the Church said to the parents we will support you in raising your child in the faith... what does that mean? Are we fully embracing that supportive role as a faith community? Or, are we doing the minimum by simply providing a weekly model focused on children when we all know we have got to get to the parents! To Brian's point, I came into my own faith particularly by learning the teaching of the Church. I believe that there are many entry points to our Catholic faith and tradition but, with good formation, those can lead to the others. I believe firmly in offering good, systematic catechesis, the people have a right to it, and it's what the Church asks us to do. I just wanted to say that I would never discount it. 1) In my experience, parents don't necessarily feel they are doing all they need to do. They often don't know what to do, how to do it, and how to reorganize their lives to make it happen. I grew up in the Church and have built the rhythm of participation in the Mass part of not only my life but in the life of my family. I grew up knowing the value of the Mass and that missing Mass was a sin (though not necessarily why it was until later). To know the centrality of the Mass is to have been catechized at some level. Case in point: I just got a new student in our First Communion program. The mother, while having been raised Catholic, has been going regularly to an Evangelical Church but has brought her child to us because that church "doesn't do First Communion". She is earnest, she has great faith, and she is motivated my the Sacraments. But there has been a disconnect. 2) Parish religious education programs only have few connecting points with parents if the program has been organized that way. But programs aren't required to follow one model. It is not at all difficult to change a program so that there are regular connecting points. I do weekly classes in a classroom (I think that style gets discounted too easily) but I modified the model in different ways. I do regular parent meetings and parent/child sessions across the board. I also reorganized drop-off and dismissal so I can socialize and have conversations with parents. I also offer more parents things (teaching, social, and service) during religious education. For parents who send their children, religious education is the best way to do ministry outside of Mass because they are already there. It's amazing what you can accomplish in the one hour that they might otherwise do groceries or read in the car. -This depends if they go to Mass. Otherwise they are not benefiting from the Mass. My job is to help them get to Mass. My program happens between Masses to better help them get to Mass. In fact, there are ways to help them get there even if they don't go. Sometimes we have special blessings or commissions at a Mass for the kids and parents will almost always be there for that. Often we'll also give kids or even parents appropriate liturgical roles. It does make a difference. Many parents find their way back. -Secondly, what I mean by "walk with parents" is to tailor what you do to serve pressing needs. They can share what their struggles are, they can get added opportunities to see our faith from a family's perspective, and they can build a community with one another. At parent sessions, I regularly do small groups. Why? Well, notice how many parents don't know one another. The parish is their community but they don't tend to relate to one another outside of the church building as the baptized. Nothing is greater than the Mass, it's the source and summit. But there have to be steps and companions, there has to be "the walk". It's the move from the "you" or "I" or "they" to a communal "we". Heaven is a community and that begins here. I like talking about this stuff so if you'd like to keep talking here, let's go for it! My e-mail is t.acemoglu@gmail.com if you'd like to talk more! Great essay.......granular and not grand! Reaching the parents through their children was the bedrock of Parish creation and maintenance. The American Catholic Church was built on this concept....build a school and a parish will follow. A parent wants what is best for his children and the schooling is at the heart of this "best". However distant a parent is from his faith in daily practice, the echoes of goodness and the realization of values recommends the Catholic School. Recognizing this, the Church in America rightly constructed schools before elaborate churches. The number of churches that subsisted for years in either a school auditorium or basement is testamenut to this approach. . And most importantly credit the parents who worked long, hard and collectively to ensure the success of school and in so doing built parishs full of intensly loyal people. The process allowed multiple opportunities to reconnect the parents with their faith and the obligation/ privilege of Sunday Mass .....as many as five per Sunday at many churches. IWhen the Bishops responded to the pressure of changing demographics, cultural mores and economics by simply closing the schools they ended up closing the parish or consolidating multiple parishes. As I have noted elsewhere in Comments the confounding element is that our poor immigrant forebearers (ditch diggers, hod carriers, masons, plumbers and menial workers of every stipe) could be led to build all these schools , churches and parishes but their successful professional progeny raised in these very facilities weren't led to maintain the school or churches of the parish. The were seemingly led by a subsequent generation of churchmen who disdained their own history as "an immigrant church". Leaders who see their focus and purpose advance reaching out to the poor in countries in Latin America and Africa, but were too busy to lead at home. If we want to be sponsors of social justice for others we should first pay attention to the lessons of our prior immigrant success in developing the American church and work first to revive and sustain it. Without this effort at revitalizing and rebuilding the American Church, efforts at sustaining social justice here and abroad will wither as the American Church has. The bishops must lead and the pastors must preach .....but on a granular level, one parishioner at a time, if necessary. Quit the grandiose efforts to pass social justice legislation.......politicians respond to votes and voters are individuals....lead the individuals and the politics will follow. In parish that is "led" the indiviuals will talk with and support each other. In a parish with a school, this process is magnified a hundred fold .....the commonality of the best interest of their children will be the leavening. CCD is next best option to a school but the involvement of the parents is tougher and yet even more critical. Tom Acemoglu has worked in youth formation for 16 years. He is the pastoral associate for evangelization and catechesis at St. Ambrose Church in Latham, N.Y.